Shervin Malekzadeh is a Visiting Assistant Professor at Williams College where he is completing a book manuscript on postrevolutionary schooling in Iran from the perspective of ordinary families and local officials tasked with educating “the New Islamic Citizen.” Prior to coming to Williams, he served as Visiting Professor of Comparative Politics at Swarthmore College between 2012-2016, and taught Religion and Politics in Iran at the George Washington University Elliott School of International Affairs during the Fall 2014 and 2015 semesters. Shervin's research in Iran was produced with fellowships from the Social Science Research Council and the Spencer Foundation, and includes two years of ethnographic field work in high schools in Tehran as well as archival research of primary and secondary textbooks at the Iranian Ministry of Education. He is among the first to document Islamicization as it occurs in the classroom, in the day-to-day encounter between agents of the state and ordinary citizens as they interpret, ignore, reject, or repurpose the state’s political and cultural message. Shervin received his Ph.D. and M.A. in Government from Georgetown University, and an A.B. in International Relations from Stanford University. He served for several years as a bilingual first grade and kindergarten teacher in California and Washington, DC. There he became interested in the ways in which teachers mediate between their personal beliefs, the school curriculum, and the needs of the communities in which they serve. This experience continues to inform his approach to teaching as well as his research interests, which include the politics of identity and modern state formation, power as a cultural and discursive phenomenon, the religious foundations of nationalism, the comparative politics of the Middle East and Latin America, and the negotiation of power and authority at the local level. A regular visitor to Iran, Shervin has lived and worked in Chile and Brazil, as well as in Qatar where he taught comparative politics at the Georgetown School of Foreign Service. 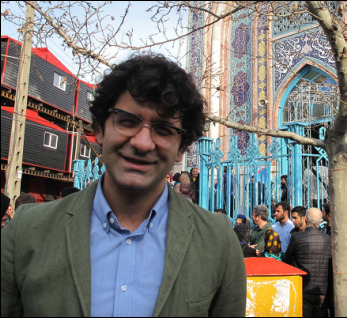 An accidental participant and reporter of the Iranian Green Movement for The New York Times, NPR, and Salon, he continues to provide occasional dispatches and commentaries on the politics of religion, culture, and elections in Iran for various media outlets, including The Washington Post, The Atlantic, The Guardian, Al Jazeera, and Folha de São Paulo.